1 My French beans often fail to germinate. Any advice? 2 Does spraying runner beans with water help them to set? 3 What are sugar peas? 4 Is it worthwhile sowing broad beans in November? It seems that the spring-sown varieties usually manage to catch up. My French beans often fail to germinate. Any advice? The commonest cause of such failure is sowing in cold, wet soil: the beans rot or are attacked by pests and diseases. It really pays to start beans off indoors, sowing them in potting compost in seed trays, in single pots, or in the individual cells of polystyrene trays. Put the seeds on damp newspaper for at least 12 hours until they swell, then sow them. Harden-off the seedlings before planting them outside—and then only after all danger of frost is past. This method may sound laborious, but it will give you excellent results. Does spraying runner beans with water help them to set? No: it has been proved to have no effect. Runner-bean flowers are insect-pollinated, and the insects are brought out by warmth. So grow runners in sheltered rather than exposed positions (erect a windbreak if necessary) to encourage insects. 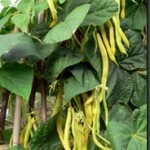 They are also more attracted to the white-flowered runner bean varieties, such as ‘Mergoles’, ‘Desiree’, ‘White Achievement’, and ‘Fry’, than to the pink- or red-flowered varieties. The flowers are occasionally nipped off by birds, so net your beans at flowering time if this is a problem. Once the pods have started to set, pick them regularly to encourage further setting. Sugar, or mangetout (’eat-all’), peas are a kind in which the pod is eaten, usually when you can just see the immature peas forming inside it. Some varieties have flat, sickle-shaped pods; others, such as ‘Sugar Snap’, are round. (Most sugar peas can be shelled like ordinary peas if they are allowed to mature fully.) They are grown like other peas, and with their sweet, superb flavour are a gastronomic treat. Cook them like French beans, ideally steaming them to retain the flavour. Because it is the pods that are eaten, you get more bulk from a row of mangetout than of ordinary peas—with the added bonus of no shelling! Is it worthwhile sowing broad beans in November? It seems that the spring-sown varieties usually manage to catch up. It’s a bit of a toss-up, and in most areas of the country one might as well wait until spring, particularly as the spring-sown beans are often sturdier because they grow under better light conditions. If you live in the north, however, it may well be best to sow them under cloches in November to give them a good start. In the south you can start them under cloches in January. Use dwarf varieties such as ‘the Sutton’ if sowing under cloches, and remember to allow access to pollinating insects. Remove the cloches in late spring. Service Tree Sorbus domestica L.